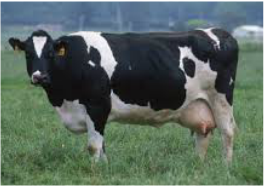 Holstein Friesians (Frisians in Europe, Holstein in America) produces the most milk of any other breed. They were bred in the Netherlands and Germany. The animal was developed as a breed that would do well on grass which was abundant in the area. At one time they were used for both dairy and beef. The Holstein is designated as one of the Wisconsin State Domestic Animals. Click the breeds for more information.